The J.S. Bridwell Agricultural Center, located on the North banks of the Wichita River, was the first phase of the Multi-Purpose Events Center project completed in 1995. The J.S. 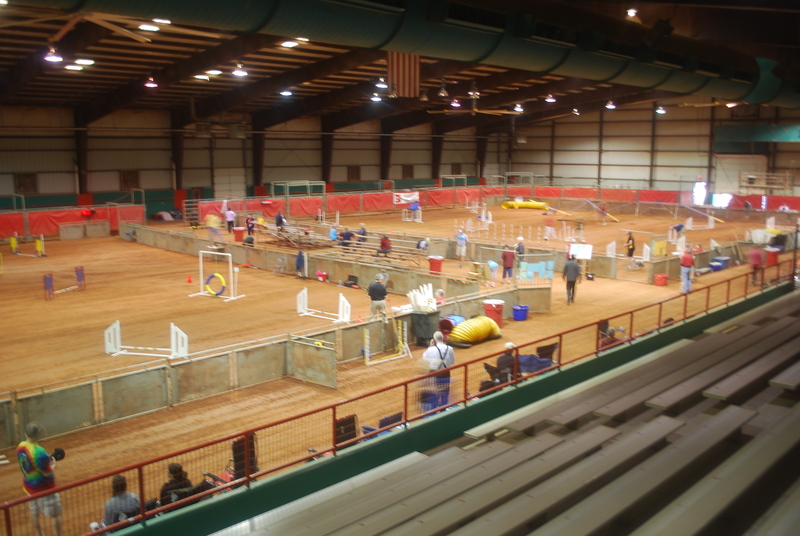 Bridwell Agricultural Center hosts everything from dog shows and rodeos to fundraiser galas. 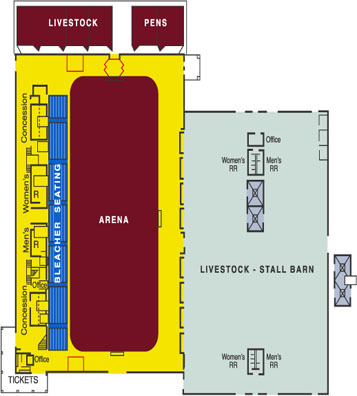 The venue includes a 50,000 square foot Stall Barn and 120’ X 270’ indoor Arena with seating for 1,200 people. 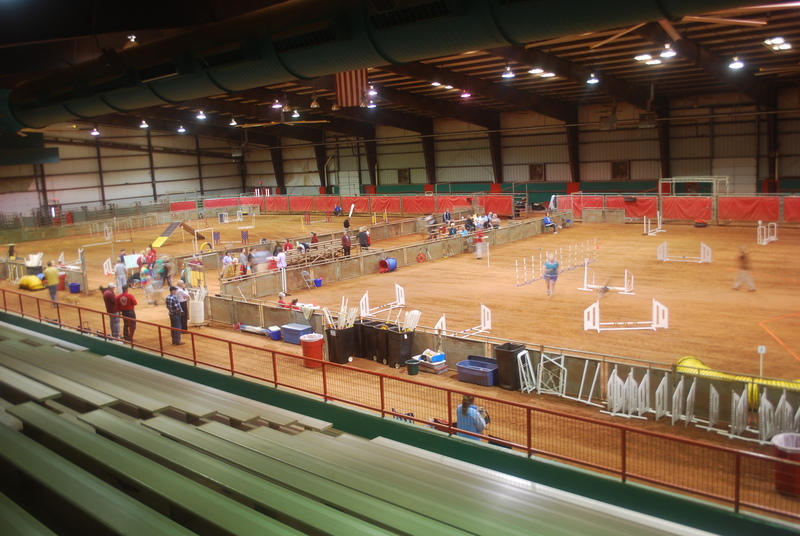 The agility arena floor is set up with two 100' x 100' rings, each enclosed with 4' solid metal panels, which do not allow dogs to exit the ring on any side. An entrance gate and exit gate (both with doors) are set up on one end of each ring. There are bleachers set up between the rings for easy viewing. The dirt surface is worked and watered each evening of the trials. There is ample crating space on the arena floor, but please bring your mats, as it is on dirt. There is also an area upstairs (there's an elevator!) if you prefer to crate on concrete. Mats are welcome upstairs as well. Normally there are several vendors -- t-shirts and miscellaneous dog supplies and paraphernalia -- available at the trials. There are several (more than enough) RV spaces right outside the doors with electric hook-ups. There's a dump station less than a mile away. You will never meet a nicer, more helpful group of people than the members of the Obedience Training Club of Wichita Falls. Their main goal for the trials is for everyone to have a wonderful experience. From the south on Hwys. 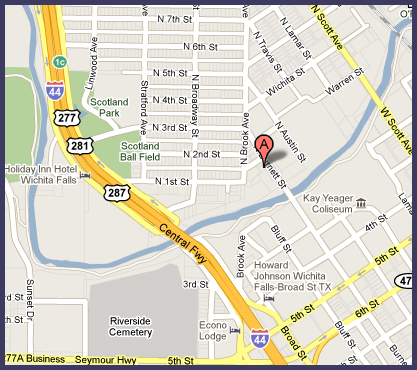 287, 281 or I-44: Take the Broad Street/Business District exit to 6th Street and turn right on 6th Street. Go left on Burnett Street and proceed two blocks to the JS Bridwell Agri Center. From the north on Hwys. 287, 281 or I-44: Take Exit 1/Hwy.277. Turn left on 6th Street and then left on Burnett Street. Proceed two blocks to the JS Bridwell Agri Center.